Boy has it been a great few months for this app. With the release of Iron Man 3 and Apple featuring us as an “App for the Blockbuster Season”, there has been a lot of users downloading the app. So I just wanted to say, thank you everyone for supporting and contributing to the app! Also with the new update, please remember to review the app again as the review score gets reset after an update. The reviews definitely help the app and really appreciate everyone who’ve reviewed it! 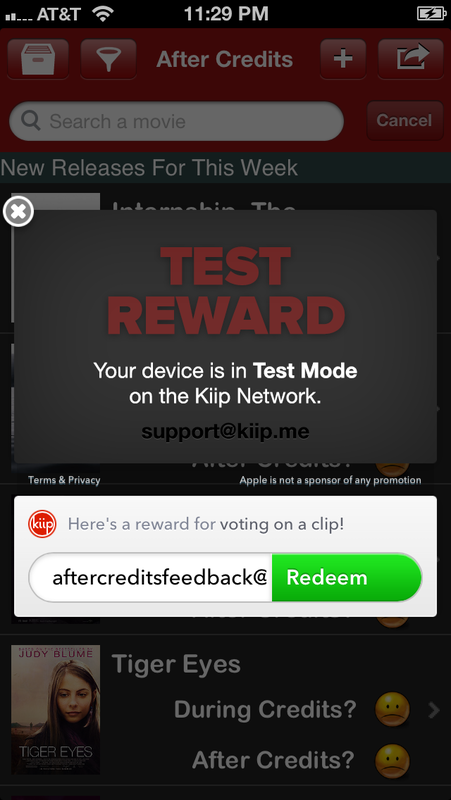 Introducing Kiip Reward! I’ve partnered up with Kiip to reward users that contribute. An reward banner will pop up after a certain amount of time that the user votes, submit, or update. This amount of time of contribution is random so that users could not just keep voting for every movie. The rewards will be tied to entertainment area so you’ll see rewards like gift certificates for theaters or free movie rentals at RedBox. Don’t like the Kiip Reward? No problem. You can turn it off in the new settings. 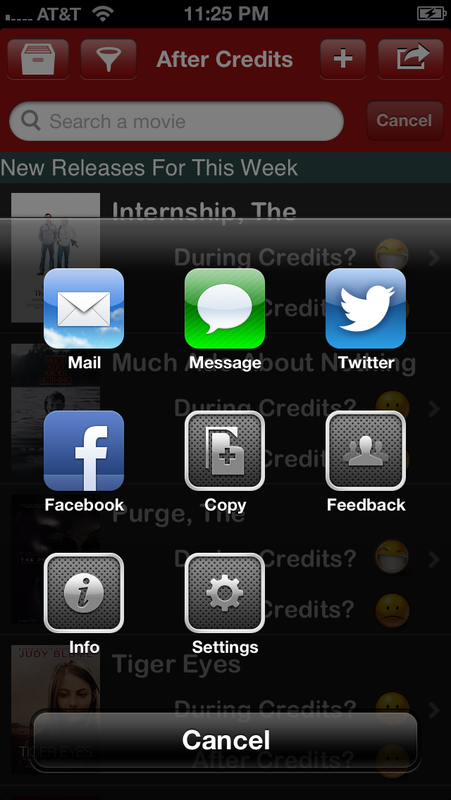 You can find the settings option in the share button as you can see in the above photo. In here you can also add some more new information about yourself like your gender and age so that the rewards can be better targeted to you. As for the Clear Cache option, only use this if you think this app is taking up a lot of space. 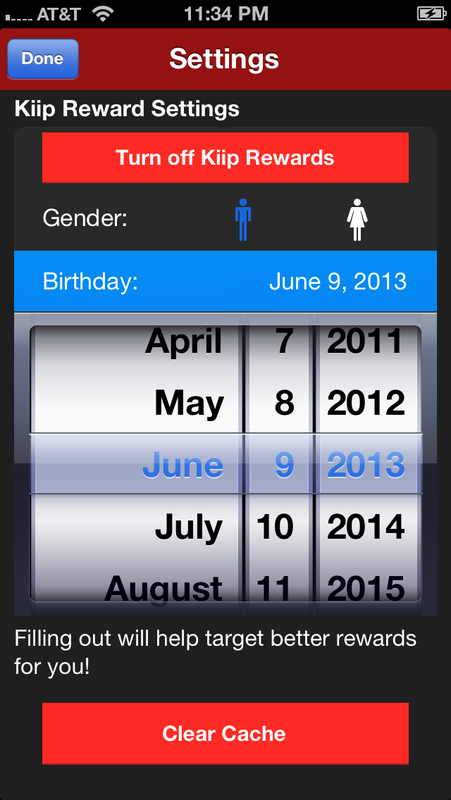 This has been one of the most requested feature for my app ever since the beginning of the app. I was not able to do this until now as the database I’ve used and how I’ve created it could not really do sorting/filtering. Fortunately, I’ve changed my database and reorganized everything to make this process easier. 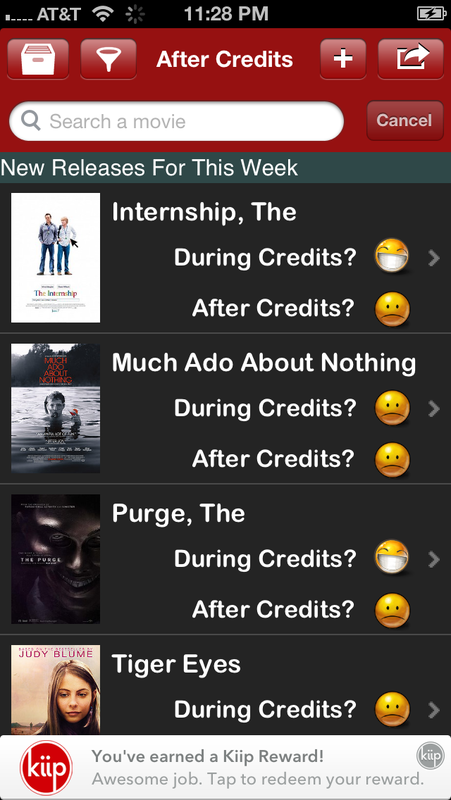 Now users can combine sorting options with filters for After/During credits. The best thing I like to do is go into the archives and sort by release date with oldest movies first. For some reason, I love seeing when movies come out. With the growing users and also the growth of the app, the archive is becoming big! Right now there is a little over 400 movies. That is huge compared to when I started with only 80. So with a bigger archive, users will have to wait a very long time to load everything. This is why I’ve made it so that it only loads 150 movies at a time. As you scroll to the end, the next 150 movies will load. This will shorten the load time as well as load times when users change filters. I’ve moved the add button out of the share screen so that it is more in the front and easily accessible. The filter button is also on the top. With these new added button, I had to change the archive button to just a button with an icon. Hopefully people will get that this means archive. Maybe one day I’ll change the design to more tab bar focus but for now I think this is the best. The submit/update screen also have next/previous button so you can just keep going next to fill out all the info much quicker. Also the submitter username appears in the front when you open up the movie instead of hiding in the details screen. 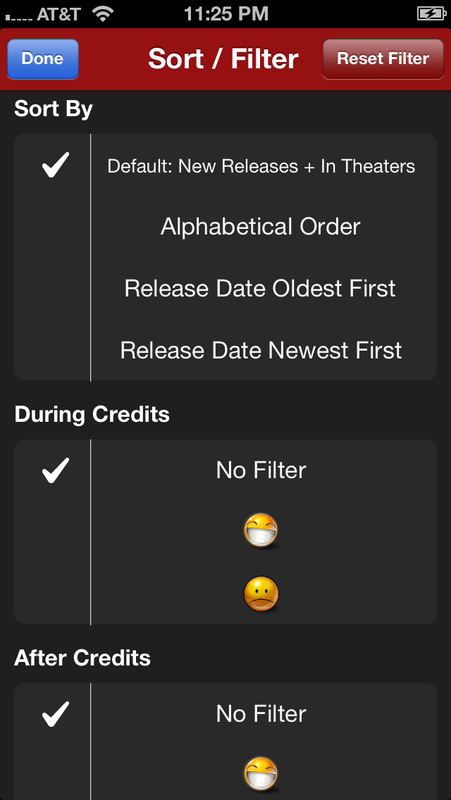 The detail screen now shows the release dates as that was something some people wanted to know for some movies. All in all, I believe these design changes were for the right reasons and hopefully people will appreciate it! Increase in users = increase in submissions and updates. It is getting hard for me to figure out what some of these updates are and what difference they are to the original. Sometimes it is just a grammar check, othertimes it’s a whole new spoiler block. So with the notes for the reviewer (me), it will help me understand why you would update this movie. Hopefully people use this but if you don’t there are somethings I’ve added that you would not see on your side to help me also. 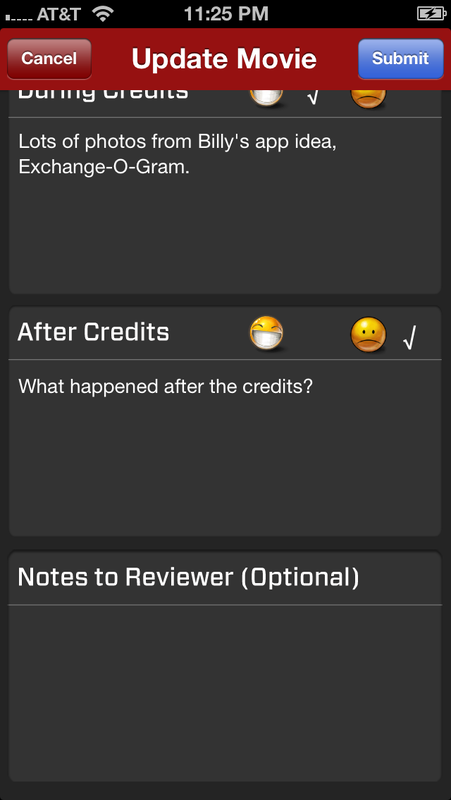 This entry was posted in Uncategorized and tagged After Credits, After Credits app, Anything After, App Store, App Store Update, Apple, Applications, Clips, Credits, During Credits, Featured, Filters, iOS, Itunes, Movie, Movies, Search Movies, Spoilers, Stingers, Users, Waka Waka Zaku, Xcode. Bookmark the permalink.